It’s blowing hard enough for the little lug-rigged boat on the right to be deeply reefed with her mizzen furled. She may be a small pilot boat of the type common in the Thames estuary. The main subject, a ship-rigged vessel, has single-reefed her topsails. Her crew is furling the mainsail, while others sheet home the jib. Under the command of Capt. 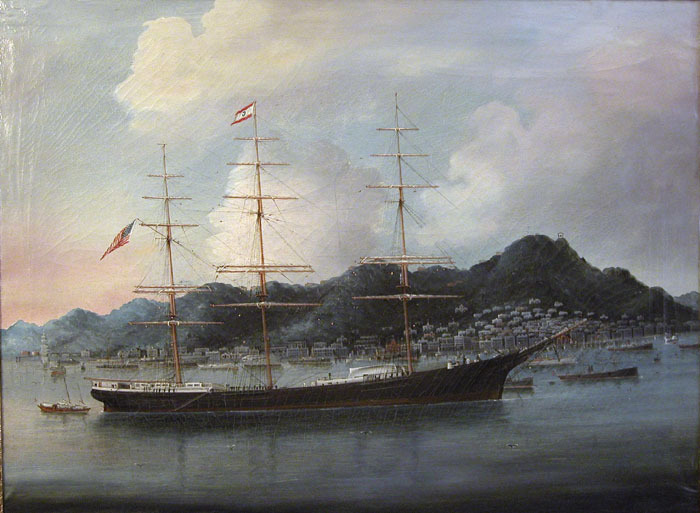 Daniel C.Nichols of Searsport, in Hong Kong Harbor, near the end of her sailing life. 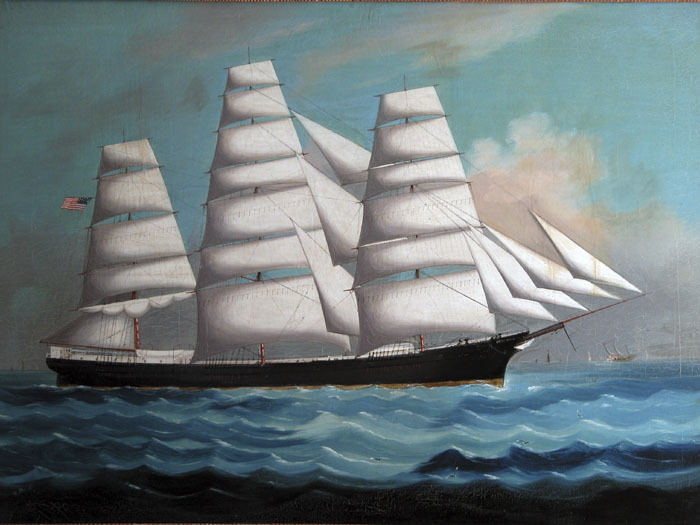 The painting originally had one mast placed incorrectly. The captain had the artist correct it, but the reflection in the water was not painted out. The picture shows four reflections for three masts. 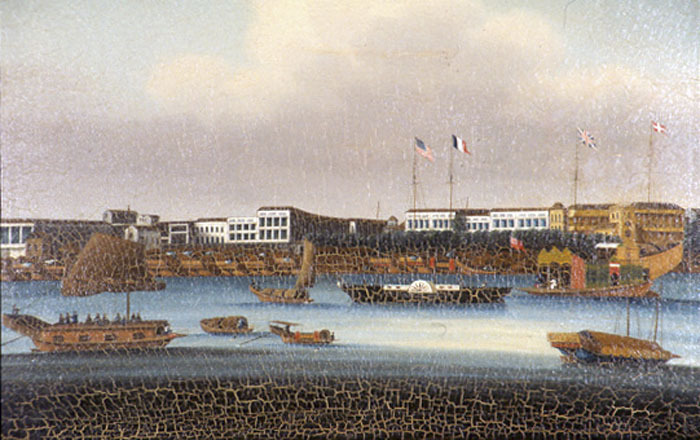 Chinese painting of the Hongs of Canton and a view of Canton Harbor, c. 1850. 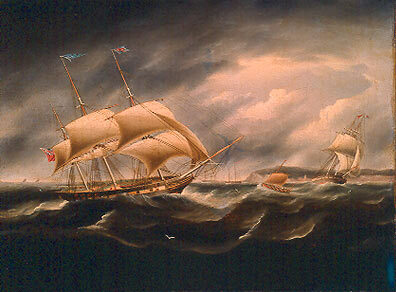 These painting were produced in quantities to sell to the western merchants. 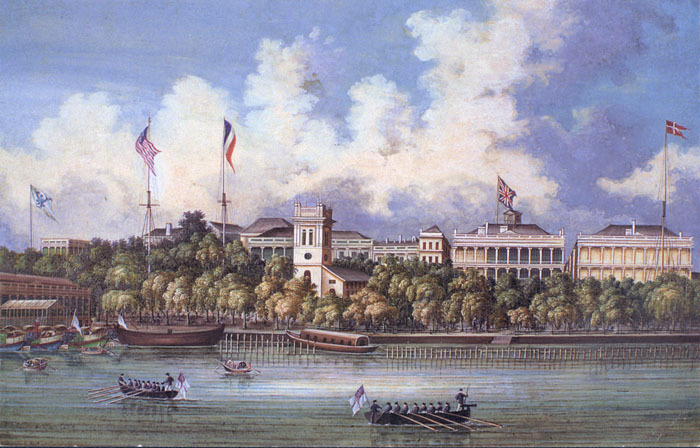 There are six Chinese junks and an American steamboat in the foreground. Flags of America, France, Britain and Denmark fly. A massive fire destroyed these buildings in 1856. Hongs served as residences, trading headquarters, and warehouses for western merchants in Canton. Westerners were restricted to the Hongs. 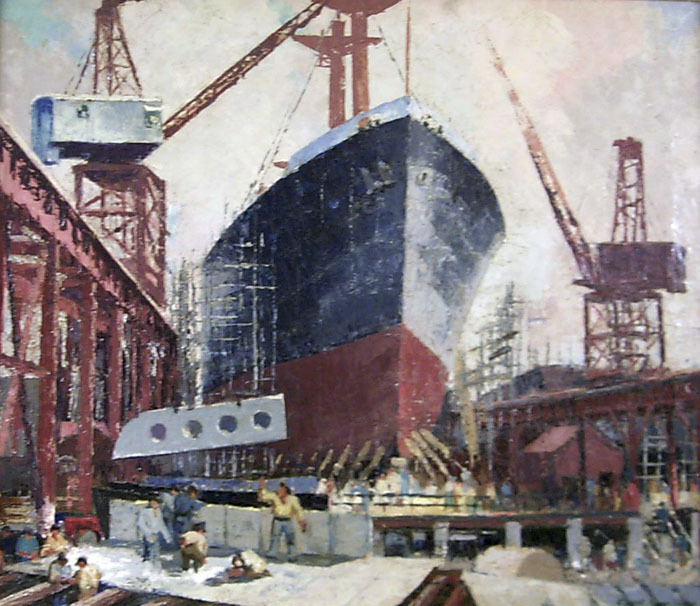 Painting, "Shipyard," by Carroll Thayer Berry, possibly based on the artist's work at Bath Iron Works during World War II, although the vessel being built is a merchant ship, not the warships that were built at Bath. 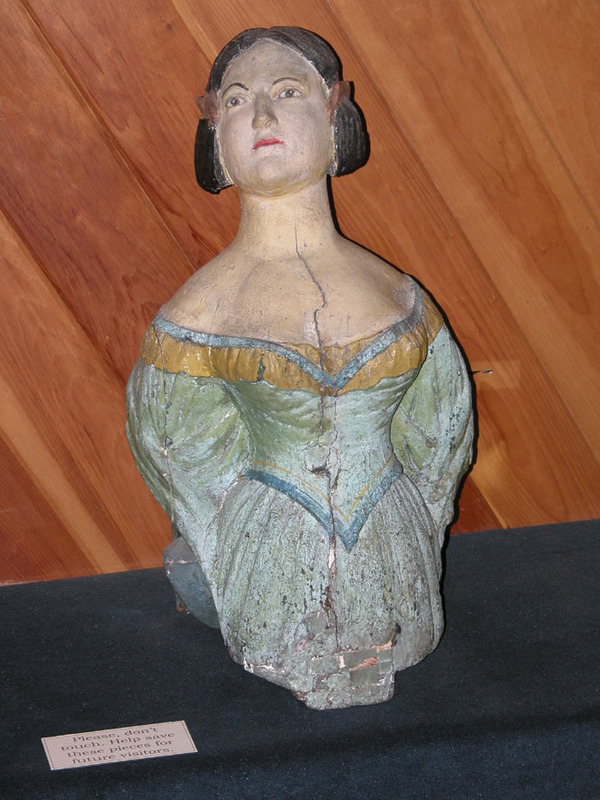 Figurehead: of woman from hips up and cut off at elbow, polychrome. 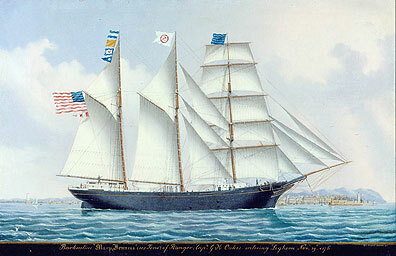 Rockland-built clipper ship Red Jacket. 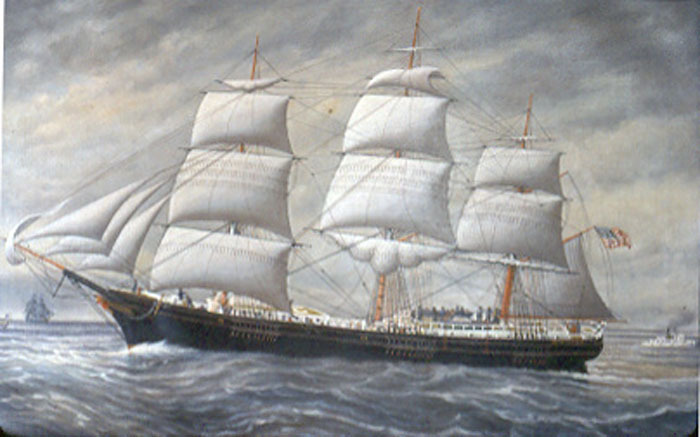 Launched in 1853, and famous for her fast 13-day, 1-hour passage from New York to Liverpool in 1854, she was sold to British owners for regular passage between England and Australia. 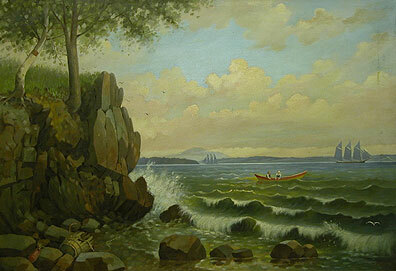 When Percy Sanborn created this painting Red Jacket was long gone.